This is a sourdough batard i baked using a TEFAL small grill oven that i found in my friend's house. After mixing and kneading for 5 minutes, rest and knead again after 5 minutes for another 5 minutes utill smooth and tacky, not sticky. Round, and store in a refrigerator for 24 hours and upto 3 days. After mixing and kneading for 5 minutes, rest and knead again after 5 minutes for another 5 minutes utill smooth and tacky, not sticky. Round, and store at room temperature for 24 hours. If more, store in refrigerator for upto 3 days. I cut both BIGA and SOAKER into pieces and joined them together in a large bowl. As the BIGA dough is acidified from the levain, it held shape properly. I added 5 gram salt, and gently kneaded for 10 minutes until smooth, rounded into a ball and left to ferment. Gentel stretch and fold in the bowl every 1/2 hour for 2 hours, followed by stretch and fold on a floured bench after another 1/2 hour. GEntly Spread the dough into a square (do not deflate). Preshape into a batard, leave for 5 minutes, and shape into a batard, and placing the dough seam side up in a Proofing basket for 45 minutes. Pre-heat the oven for 35 minutes with a stone, and River pebbles in an iron sheet as a steaming source. After 45 min. Invert the Dough on a peel and transfer the dough into the Oven, and pour hot water on the pebbles to create steam (mind your oven glass), reduce temperature from 500F to 450F. Remove sheet containg pebbles after 15min. and continue to bake for another 30 minutes until golden brown. Transfer to a cooling rack, and cut after 2 hours. 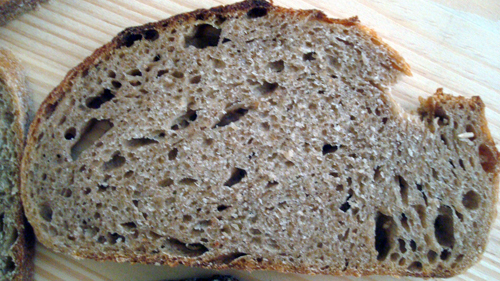 Taste: I liked the tangy sour flavor of wholegrains. It made an excellent toast, with sliced emmental cheese as a topping. I could have had a fluffier more open crumb by using 10g commercial yeast in the final dough , but opted not to. Will I Duplicate it another time? I may, but then i would like to include commercial yeast to boost it, as the starter was sluggish and more acidic due to only 1 refreshment from the fridge. Mebake, I like the crumb just the way it is. Maybe another refreshment would make the starter more active if left to ferment at RT. A well shaped and scored loaf my friend. Mebake, that is beautiful! Impressive. Something to strive for in my own whole grain sourdoughs. Thanks for sharing! Come to think of it, I have a ton of barley flour I need to use up. How did you like the barley flour in this formula? Did it make for different handling characteristics of the dough? I used some once before in a whole wheat sourdough and I thought maybe it added a "moist-ness" (?) to the crumb. I know I'm not describing this well, and the crumb could have turned out that way from many other factors- but could you share your experience with the barley on this bake? I'd like to try your formula. Thanks! I'm with Eric - crumb and crust look very tasty to me! Good job! Thanks Eric!, I agree with you for the additional refreshment. Iam inspired by Hansjoakim's scoring patterns, you can clearly see that. I'd love to see your takes on wholegrain loaves. Thank you inlovewbread. 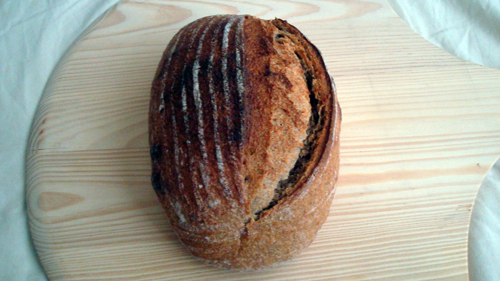 Inthis loaf, barley flavor was overtaken by the overall tangy flavor of the sourdough levain. Barley expresses itself more with commercial yeast, or less levain (this formula had 50% levain, which is too much i think). 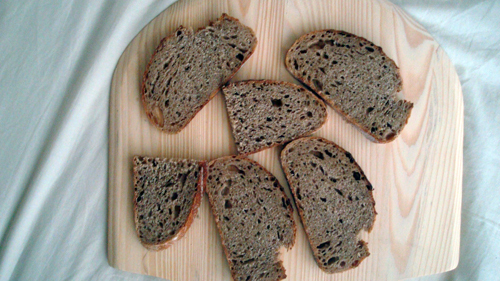 The Dough was stickier thatn without barley, but not difficult to handle, and the crumb was moist as expected. 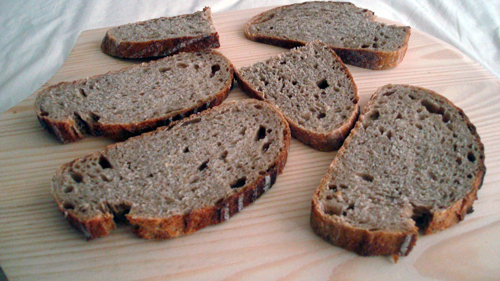 I would not include barley in such a flour combination, now that i have consumed the whole loaf :P. Waiting to see your barley version inlovewbread! Thanks alot larry, it was tasty with fermented cheese on top, and Salami.